They like to Payet forward. So is this the 3rd Cube sequel? If that’s the case, let’s hope that this fantasy twist will end up less terrible than Cube²’s sci-fi twist. You guys are really square. Question: What is Gravedust doing in the last panel? A) He’s spied the spirit of a bookworm. B) He’s noticed they’re being followed, perhaps precipitating the return of everyone’s favorite Gnome. C) He’s about to favor the party with a rendition of MMMBop. Looking for a place to urinate. He just spotted a plate of yummy cupcakes. He’s looking for where their eyes went. That doesn’t sound like it’s likely to result in success. So this is supposed to be a civil campaign? Damn, Lois Bujold is going to sue the hell out of the writers! Panel Three – When did Carol Burnett join the cast? Hah! I missed that the first time around. Nice catch! lol, thinkin the same thing. I have no idea why a self respecting party would go without a thief. because bards can cross-train in detect traps. They’re not as good at it, but they can do it. Did not know that. That’s nifty. Still, I don’t truly believe any adventuring party is complete without someone who fits the thief archetype. Maybe it works well in D&D, but this isn’t that and I’m kind of speaking in a more general sense. It can (theoretically) work in DnD, but why make things harder for yourself? Some people think Rogues don’t have enough combat ability. They are wrong. Take the two-weapon fighting feats (all of them), use a pair of rapiers (which should not be practical, but is), with +5, Keen, and Vorpal. I also recommend the Improved Critical feat. At high levels, you end up with eight attacks, instant killing on a 9+ (with a D20). If they’re undead (or otherwise immune to critical hits), then the 120d6+40 (not including Strength Bonus) will still kill them. Three levels of Temple Raider of Olidamarra (prestige class), and you make it 163d6 and you can teleport. If you’re marginally less keen on breaking the Rogue (and, frankly, breaking is just too easy), then the MANY d6 of sneak attack (even without any attempts to boost it) will do just fine to give it combat ability. Also, they have even more skill points than a Bard. It’s just not fair. There is no reason for a party to be without a decent rogue. I agree. Pathfinder rogues are versatile and unless you just aim for it, they don’t lose their combat effectiveness, even when they are mostly focused on skills. 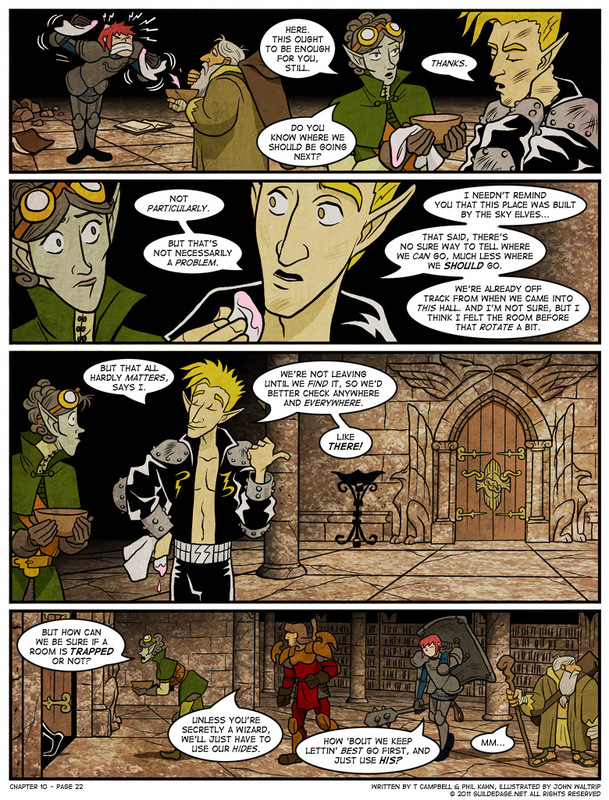 I don’t know much about DnD beyond what’s in baldur’s gate and what’s come up over the course of following fantasy webcomics. It just seems to me like backstabs, stealth, lockpicking, poisons, trapping, trap disarming, and familiarity with seedy crowds are all things that I would never want to be without on any manner of journey. Be it in a dungeon, a city, the wild or a warzone. The thief archetype is the most likely to have these things as a general rule. Heck, between traps, poisons and stealth there’s very few forces a thinking man with sufficient preparation couldn’t handle. The rest is needed for utility, but if we’re talking combat it’s the lever principle. Give me a big enough rock/stick and I’ll move the world. Give me enough time to set up and I’ll slay anything from dictators to the Gods themselves. Oh, forgot to mention thievery. Always need a pickpocket. Don’t know how I forgot that when talking about theives lol. Listen to this person, they know of what they speak. Enough for a Gold Star, surely. Your last sentence sums it all up quite nicely. Getting properly prepared is definitely key to a rogue’s success. The ability to sneak / hide and attack (or not) at the time and place of my choosing, while being very Sun Tzu, is pretty close to how I operate. Ideally by the time the battle begins, your victory is already assured. People who say rogues don’t fight well didn’t have their rogues live long enough to pile up all that stuff. People who say rogues don’t fight well don’t know when not to fight. … Picking “rogue” makes it harder on yourself, if you want to go full on broken. Just FYI. Great! You now have absolutely no other feats. You’re a rogue, after all. No bonus feats for you. Also, now you’re at such a high level (to meet the prerequisites) that a wizard can summon infinite titans in a single turn with a single spell. One spell. No feats or other neato-finagling character building whatsoever required. Have you even looked at the penalties for having a medium weapon in your offhand? That’s an epic-level weapon. You know, epic spellcasting is an infinite loop. Make a skillcheck to make your bonus bigger. Use your bigger bonus to insta-win. Secondly, relying on epic-level weapons to do everything for you? That’s not a sign of a powerful character. How do you fit it in? You’ve got no feats left. You’re still buying two-weapon feats after level 21, you know. Wrong. You get 6, tops. Rogues don’t have full BAB. 1) Crit-stacking doesn’t work. Keen and improved critical explicitly don’t stack. 2) Weapon Master prestige class is an old, not-3.5 compliant prestige class that doesn’t actually work the way NWN portrays it to. 3) Vorpal weapons only work on a natural 20, not on ANY critical hit. 4) And even if they did, you’d still need to confirm the crit first. -At high levels, the undead are most likely going to either be incorporeal or spellcasters. Spellcasters are MUCH more powerful than rogues, and your super fancy rapiers aren’t ghost-touch. Say goodbye to your con score. -You have to hit to deal damage. – Uhh. If everything DOES hit, then you get… 6d6 + 30 + strength bonus. And you’re going to need natural 20s to hit with your terrible BAB, lack of strength modifier (and lack of weapon finesse – you are still buying TWF feats). No sneak attack, no critical. 6 attacks for having a 3/4 BAB class at level 20. Epic BAB never grants more iterative attacks. I’m not familiar with that PRC, but given the problems I’ve outlined above, I’m sure there’s something wrong with this plan as well. Broken rogues usually go halfling throwing builds, in my experience. And they cost a FORTUNE because they’re throwing acid flasks and/or alchemist’s fires, and check up the cost of tossing 12 or so of those a round. Hey, did you know bards, with a single level dip in crusader and a few well-chosen feats, can make EVERYONE do +12d6 sonic damage on EVERY attack, plus heal the party without taking up actions, plus make the 8 attacks you thought rogues could do? And they have way more hp, and way better saves, and way more utility in general? And that since their charisma is going to be much higher (they’re SAD as compared to a rogue’s MAD) so they are a much better party face? I can go on and on about the virtues of bards – not even counting getting 9th level spellcasting on them via PrCs – but I won’t. Sorry, but it’s true. Bards > rogues. Spellcasters get the best trap nullification / detection system of ALL TIME. Seriously. Reserve feats -> infinite summon elementals -> walk walk walk TRIGGER. Free resummon. Walk walk walk trigger. Check it out. And if you discover it’s self-resetting… Well, hello? You can trigger it as many times as you need to to figure out how to get past it without losing any resources. I’ll settle this nonsense of bards versus rogues with PALADINS. Watch me not post paragraphs of nonsense that is not worth reading to back it up. Because my point is self evident. Hey, I wouldn’t normally go all “rules lawyer” but when someone is posting LUDICROUSLY incorrect material, I can’t let it slide. It could easily mislead and confuse someone else in the future. There was literally no single correct statement in his entire post. Several statements were actually wrong on MULTIPLE levels simultaneously. Barbarians get trapsense, damage reduction, and plenty of HP to soak up hits when things go wrong. Were this a D&D party, I’d put Byron on point. but Best is waay higher level, so has better defenses. The idea is, that adventuring parties, unless artificially made by someone, are made up of people by chance. The story bring the people together, not the skills. Have you ever heard this in your head before: “Hm… I am very good at talking my way out of things, but if things go wrong, I need a strong guy, and a rich one too with good connections… I’m going to get such friends…”? I don’t know… I get friends or “party members” through chance. Its called networking… and you don’t search for friends, you search for contacts. Of course, to be able to pull something good, you’ll need to be friendly. It’s more a cyberpunk kind of thing. Of course the skills bring the people together. If I’m asked to stop WW3, the apocalypse, or really any sizable undertaking I guarantee you that acquiring allies is the first thing on my list. You, dear sir, clearly learned nothing from the Grey Wardens. It’s all about the allies, and they don’t just happen by happenstance. You gotta go out there and find them. If I were in charge of this group before even entering the dungeon I’d head to the nearest city and find a capable neerdowell to bend to my cause. Find out what he wants and make sure he’ll only ever be able to acquire it at my side. Well, you found me here… I don’t have MaceBook, but I heard of that thingy. :P What quest do you want to undertake? You don’t need a rogue/thief when you can just break any and everything in your path. Unless it’s one of those silly games where wooden chests and doors are nigh-invulnerable. That is to say almost all of them. Lol. Actually plausible. Would be too perfect. I’m hoping that the Basin is an old toilet. He has to go first, if only to keep them from calling him Second Best. Just pointing that out before we get a bunch of comments about how he’s an ungrateful douchebag later on. My own whining done, he’s actually not being a bad leader here, as far as parties go. They should probably have Gravedust making a map as they go along, but considering that they’ve somehow already managed to lose track of where they are… Might not be useful. ESPECIALLY not if the rooms actually rotate. Payet Best is a living pun engine. I wonder if you could harness that power and use it to power vehicles or lighting or something. I have to say that panel 4 is probably the most feminine I’ve seen Frigg drawn. It’s the hips, I think. She’s rocking the baby-making hips. I agree. Even naked with Best a couple pages back, she’s got the macho thing going on in her posture. There it looks like she’s practically sashaying. One door closes, another one opens? This made me think that GD actually sees Best coming out from the other side. Guys! Listen to her! Confound these adventurers distracted by their own troubles. They drive me to drink! The room isn’t rotating, its simply shoddy union work (the whole building is actually shifting on its foundation). See, they should have went with those workers south of gastonia’s borders. I hear they work hard for low pay. Has Gravedust just realized that the statues had souls? Perhaps he has seen his nemesis Tombdirt. Ah, but mystics are mysterious in their ways! I pictured him going back to get a map… or going the right way just for good measure. I love you people so much. This is pretty mush the highlight of my week, because this comic is just the Best that I’ve ever seen. For cereal. Much. Also, I feel stupid for that one. Thank you so much. We do it for you. Bravo, Thracecius, you have just iterated what we all think.